At the time, Blomkamp made it clear this was something he had done on his own, and it had nothing to do with the studio, namely 20th Century Fox, which has produced and released all the films in the Alienverse. More recently, though, Blomkamp explained how this all came about, in speaking with the website, Collider, stating how much he loved the Alien films and that working with Sigourney Weaver on Chappie only spurred his interest even more. Sources have confirmed that Blomkamp has indeed been signed by Fox to direct the next film in the Alien franchise, as reported by both Variety and TheWrap, and that Ridley Scott, director of both the original Alien and the more recent Prometheus, which was also set in the Alienverse, will produce via his Scott Free production company. In addition, Scott is still set to direct the follow-up to his very successful, though somewhat polarizing, film, Prometheus. Which means we wil be getting TWO Alienverse films in the near future. Scott had previously stated that the script for the Prometheus sequel had been completed. Now, the question on everyone’s mind is whether Sigourney Weaver will return as Ellen Ripley. 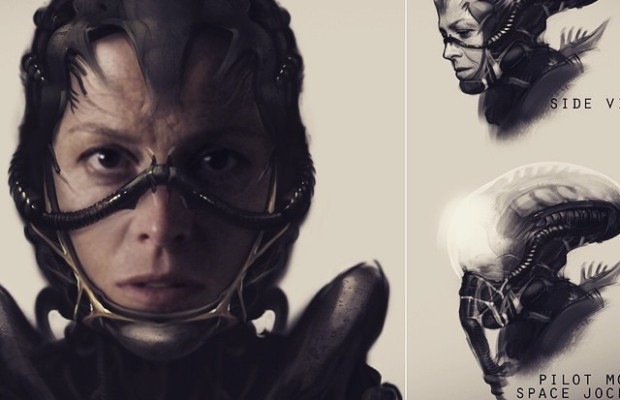 And based on the concept art Blomkamp created, plus his association with her having just worked together on Chappie, and Sigourney’s previously stated desire to continue/finish Ripley’s story, this seems to be a very real possibility. Promoting Chappie on The Tonight Show starring Jimmy Fallon on Wednesday, Jimmy brought up working with Blomkamp on a new Alien film, much to the delight of the studio audience, along with a drum roll by Questlove of The Roots, and Sigourney said, “We’ve been talking about it. He is so talented.” She also mentioned bringing it up to comedian Louis C.K. at the SNL 40 celebration, and he stated he wanted to be in it and he wanted to “die in a terrible way,” following that with, “I’m sure something can be arranged.” Louie certainly wouldn’t be the first comedian to meet such a fate in an Alien film, as Paul Reiser eventually got what he deserved in Aliens. And, speaking of Aliens, that’s the last time we saw Michael Biehn as Corporal Hicks. 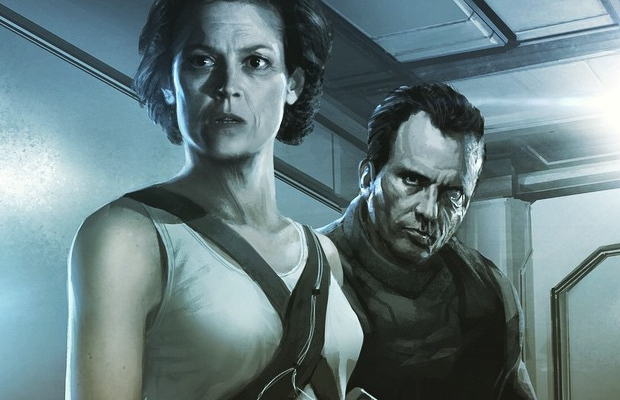 As he has popped up in Blomkamp’s conceptual art, could he return as well as Ripley? [***Spoiler Alert*** for the 2 or 3 people who haven’t seen Aliens or Alien 3] Though Hicks unceremoniously met his demise during the opening credits of Alien 3, Ripley herself didn’t make it out of the film alive either, yet she was brought back as a clone in Alien: Resurrection. So, in the world of sci-fi, anything is a possibility. Anyone familiar with Neill Blomkamp’s work with District 9 and Elysium can see that he is a visionary director whose work has political undertones. And based on his obvious love and respect for the Alienverse, he seems like the perfect choice to do another Alien film. The Alien films have always tapped talented directors with their own unique vision, from Ridley Scott and James Cameron to David Fincher and Jean-Pierre Jeunet. Blomkamp’s documentary style and his realistic use of special effects should lend itself to an interesting take on the Alien universe. We’ll have to see if Blomkamp will shoot any of the film in his native South Africa, as well as work with his regular collaborator, the terrific actor, Sharlto Copely. And, of course, we’ll be waiting to see when in the timeline the film will take place. The Gore 4 wouldn’t mind if it picked up after the events of Alien: Resurrection, and included actors Ron Perlman, Dominique Pinon and Winona Ryder, though that seems doubtful. In the meantime, here’s a look at Neill Blomkamp’s newest film, Chappie, set to open on March 6. And despite the Pixar-sounding title, this is an R-rated, sci-fi thriller featuring a world with advanced robots, starring Hugh Jackman, Sigourney Weaver and Dev Patel. I am so SUPER excited about Aliens 5!